Dhaka, 7 Jan, Abnews: Two Bangladeshis are among 32 crew members of an Iranian oil tanker that went missing after a fire broke out following a collision with a bulk freighter at China's eastern coast. According to China’s transport ministry, the other 30 crew members were from Iran, UNB reports quoting AP. The Sanchi tanker <C}KS7309492494>, registered in Panama, collided with the CF Crystal <C}BO7309522955> some 160 nautical miles off the coast near Shanghai on Saturday evening, the Ministry of Transportation said in statement on Sunday. 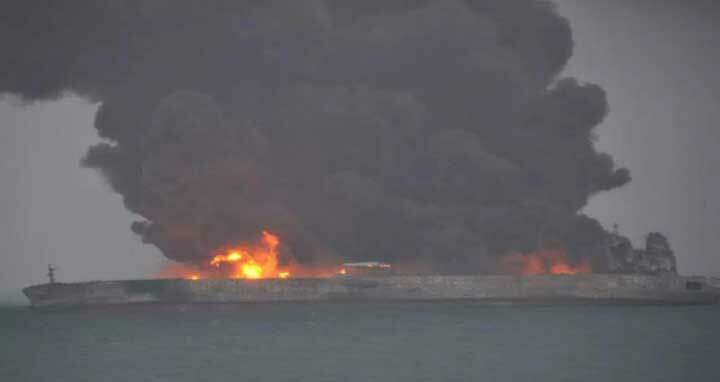 State media CCTV showed photos of the tanker ablaze and billowing plumes of thick dark smoke. Chinese authorities are carrying out a search and rescue effort for the missing tanker crew.